I chose to read this book as my 'National Book Award winner,' number two on the reading challenge list. It won the National Book Award in 2012. 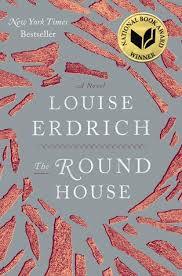 The Round House by Louise Erdrich was definitely a powerful book. It is told from the perspective of Joe, a 13-year-old Native American boy whose mother is viciously attacked. The adults on the reservation understandably don't want Joe to hear about the details of the attack, and most of them just don't want to speak out loud of the horrible act. His mother survives, but life is never the same. What really struck me was the clarifications in the afterword of how many laws about activity in or around the reservation impeded the capture and punishment of the monster who committed the crime. The reservation could not charge a non-Native American for the crime if it was committed on the reservation. What?!? The moral dilemmas throughout the story can still be pondered more than a week after finishing the book. I would definitely recommend this book both as a captivating story, and a commentary on an aspect of social justice. Sounds like a good book! Thanks for passing on the suggestion. Sounds like a very interesting film. A must read for me too. I'd never heard of this book before. Thanks for the heads up on it.